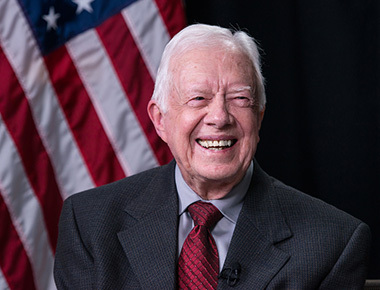 Jimmy Carter is a Georgian with deep roots in his native state, being the seventh generation Carter to live in Georgia. The information detailed here is taken from an article in Georgia Life (Winter, 1976, pp. 40 ff.) by Kenneth H. Thomas. Kindred Carter (c. 1750-1800) came to Georgia from the Bertie-Edgecombe-Hertford area of northeastern North Carolina where his family had lived for several generations. He was of the 5th generation in descent from Thomas Carter, Sr. who came in 1637 from England to Isle of Wight County, Virginia. Thomas Carter’s only known child was Thomas, Jr., who married Magdalene Moore and left a will in 1710. In that will, Thomas, Jr. did not name all of his children, but Moore Carter (c. 1680-1741) who married Jane and moved to Bertie County, North Carolina, is believed to have been his son. Moore left a will naming a son Isaac who married Ruth and died after 1790. Isaac and Ruth were the parents of Kindred and James, among others. Kindred and James both came to Georgia. James Carter married Eleanor “Nellie” Duckworth in 1798 in Columbia County, Georgia. She was a daughter of Jeremiah and Christianna Ramsey Duckworth of Warren and Columbia Counties. The Carters moved permanently to Warren County c. 1815, where they lived along White’s Creek on a 500 acre plantation, approximately four miles NW of Thomson, Georgia. Around 1835 James moved to Talbot County to join his brother Jesse and lived in the SW part of the county near Upatoi Creek. It was here that he owned land at the time of his death in Schley County at the plantation of his son Wiley. James had been a cotton planter and a Baptist. Wiley Carter married Ann Ansley in 1821 in Warren County. She was the daughter of Abel and Lydia Morris Ansley, and a granddaughter of Thomas and Rebecca Ansley and Jacob and Mary Ansley Morris. The Ansleys lived in Warren County. Wiley Carter sold his land in Warren County on Rocky Comfort Creek, near Gibson, in 1851 and moved permanently to his plantation in Schley County in Southeast Georgia, 20 miles north of Plains. The home, known today as the “Battle Place” is located, along with the family cemetery, on the Ellaville-Friendship Road (Georgia Highway 153) at its intersection with Georgia Highway 45. It was here that Wiley Carter, farmer, planter, and Baptist, was buried when he died at the age of 66. His plantation contained 2400 acres in both Schley and Sumter Counties and produced 147 bales of cotton in 1860. Wiley’s first wife, Ann, died c. 1848, and he remarried Mrs. Sarah Wilson, widow, of Newton County in 1849. In 1851 Littleberry Walker Carter married Mary Ann Diligent Seals (c.1838-c. 1874) in Warren County, Georgia. She was the daughter of William A. (b. 1814) and Eliza Harris (b. 1815) Seals of Warren County. In the mid 1850s the Carters and Seals lived in that part of Warren County that became Glascock in 1857 and it was there that William A. Seals died in 1860, and his widow in 1886. Littleberry and Mary Ann moved c. 1860 to Sumter Co. near his father’s plantation. He served in the American Civil War in Captain Cutts Sumter County Flying Artillery, serving in Virginia. Littleberry was a farmer and was buried on his farm at the time of his death at the age of 42. William A. Carter married Nina Pratt (1863-1939) in 1885. She was the daughter of James E. and Sophronia Cowan Pratt of Abbeville District, South Carolina. William and Nina were living in Arlington, 50 miles SW of Plains, where they had moved in the mid 1880’s, when he died at the age of 45. Nina then moved to Plains, where she lived out her life and was buried. James Earl Carter married Lillian Gordy in 1923. He was an insurance broker, farmer, fertilizer dealer, Baptist and Democrat. A veteran of World War I, he served on the County Board of Education and was a state representative in his first term when he died at the age of 59. Jimmy Carter married Eleanor Rosalynn Smith (b. August 18, 1927) on July 7, 1946. John William “Jack”, b. July 3, 1947 in Portsmouth, VA.
James Earl III “Chip”, b. April 12, 1950 in Honolulu, HI. Donnel Jeffrey “Jeff”, b. August 18, 1952 in New London, CT.
Gloria, (b. October 22, 1926, d. March 5, 1990) who married Walter G. Spann. John William “Jack”, was born July 3, 1947 in Portsmouth, VA. His son, Jason James Carter, was born August 7, 1975, and daughter, Sarah Rosemary was born December 19, 1978. Jack is married to Elizabeth Brasfield of Chagrin Falls, Ohio. Her children are John and Sarah Chuldenko. James Earl “Chip”, was born April 12, 1950 in Honolulu, Hawaii. His son, James Earl IV, was born February 25, 1977, and daughter, Margaret Alicia was born September 23, 1987. Chip is married to Becky Payne. Amy Lynn Carter married James Gregory Wentzel of Herndon, VA. Their son, Hugo James Wentzel, was born July 29, 1999.